I’ve been a long-time vim user, dating back to when I figured out how to exit the damn thing. Over the years I’ve tried various vimrc configurations, plugins and looks and even other editors but I’ve always come back to it for a few reasons: the main one being that you’re guaranteed it will be installed on any server you touch. I’m sharing my vim setup here and how to use the same one if you like it. To quickly get the same setup as me you’ll need to run the following commands. 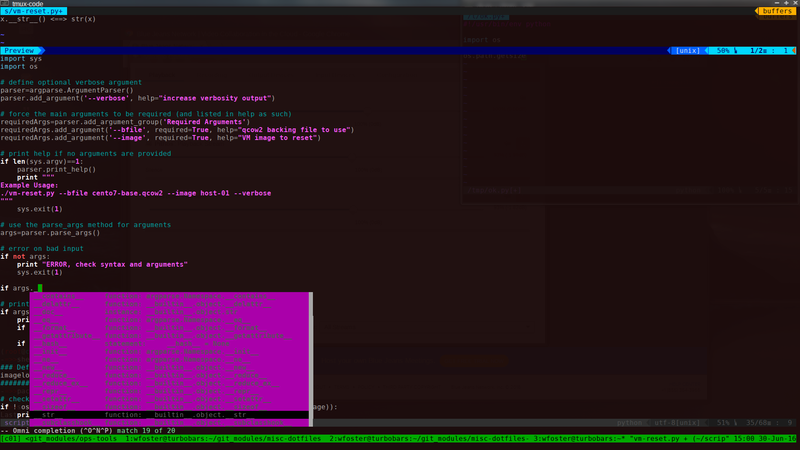 I have provided a tarball of my ~/.vim and ~/.vimrc that already have the above plugins setup and configured. Install any necessary packages first. I use Fedora, so substitute yum for CentOS/RHEL or your appropriate package manager. If these aren’t packaged in RPM you can manually add them via the Plug Vim plugin manager. This will also work on OSX by using the tar I provide, see below for further setup instructions needed in ~/.vimrc. Backup your current ~/.vim and ~/.vimrc just in case you hate it, then you can revert everything and complain about it in the comments. The regular version comes without the full code completion engine for most languages, quality-of-life highlighting, git awareness and Python syntax via docstring lookups is included via jedi. 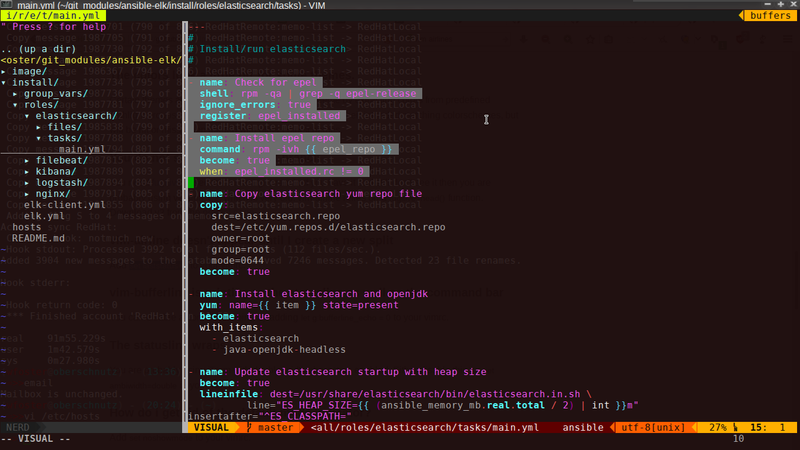 Download vim files and extract them. Open Vim and use the Plug package manager to install and update all the plugins. You can just use things right away but it’s better to clone and install the latest versions. This above clean the current git repos, which are currently set to my file hierarchy. The above will install the latest version of the plugins. 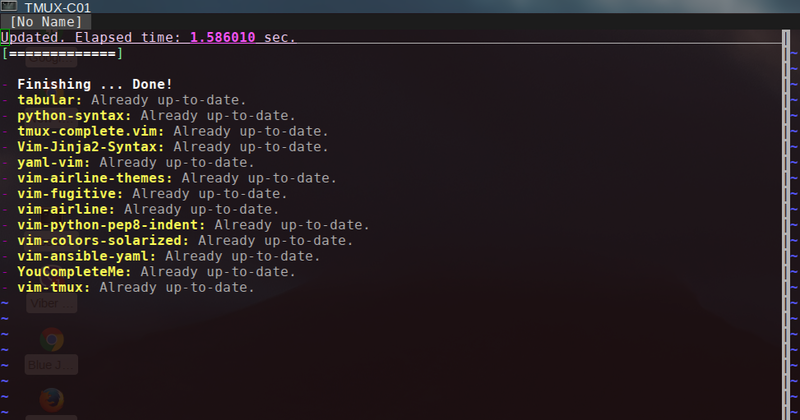 Use :PlugUpdate to update all the plugin git repos going forward when you like. Set some variables to not anger your system (like crontab or git). At this point you’re ready to go, however you may want to install the powerline fonts, they are quite nice. 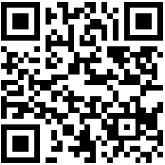 This works on Linux or OSX. The installation script installs the fonts locally. You need a few more lines in ~/.vimrc if you’re using OSX. 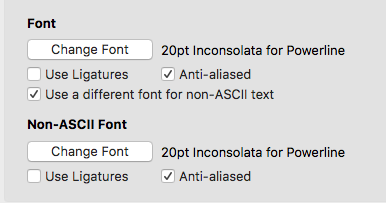 If you use the iTerm2 terminal on OSX you’ll need to now set the font appropriately in your profile. Utilizing nerdtree (control + n to open/close) which is useful when editing many files. 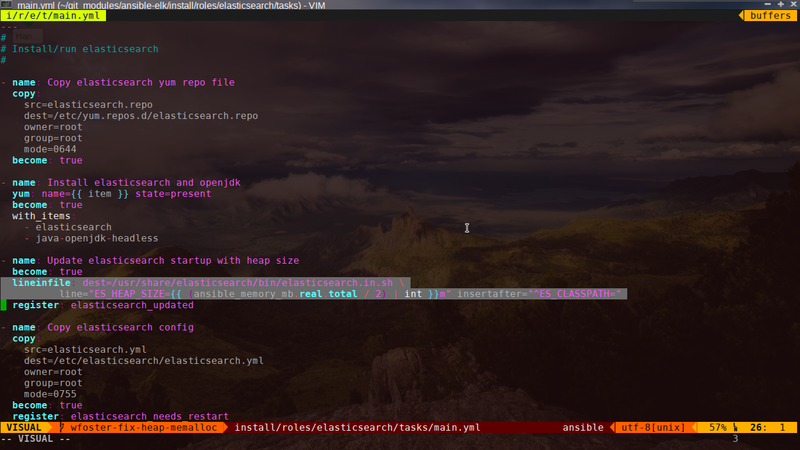 Use T to open files as new vim tabs in the background, see tips below for more commands. Fugitive plugin adds useful git branch information and functionality. Using vim-jedi (control + space auto-completes possible library syntax and shows docstring info). 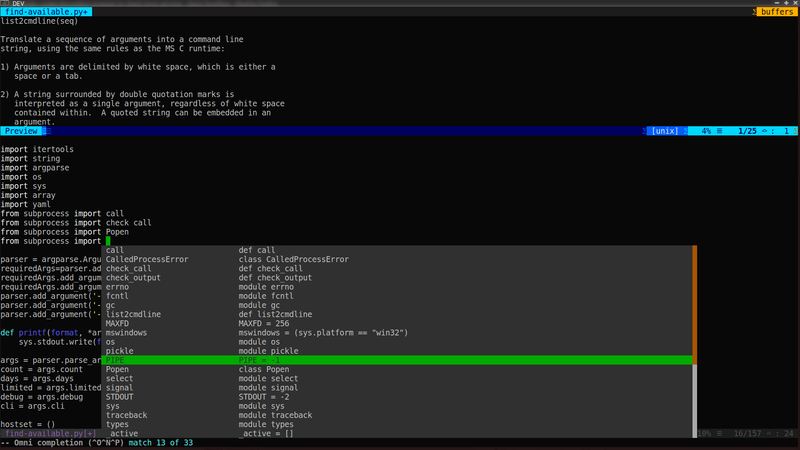 Things work in tmux as well, yes you can change the background color. The cntrlp plugin provides full search/autocomplete of files inside current git repository or directory hierarchy. 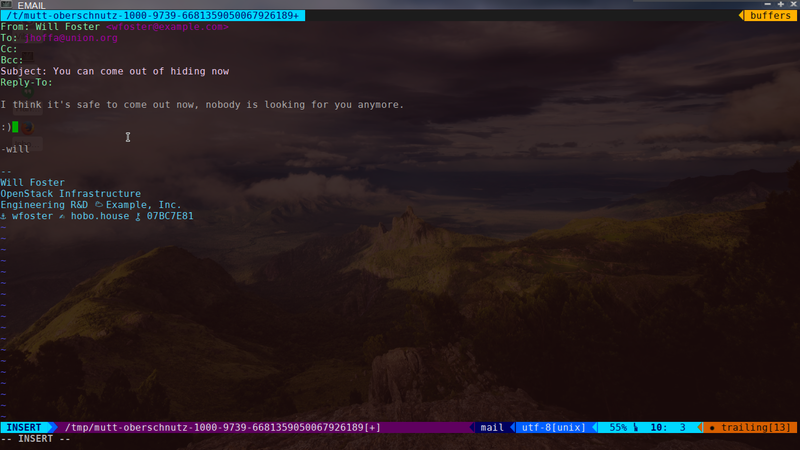 mutt compose is freshened up a bit with vim. This is a very small list, check other resources if you want to do something specific but here are some of the options I use frequently. :set nopaste – turns off paste mode. ctrl + space – toggles code completion for Python or string completion of used strings elsewhere. Am I missing any useful vim plugins? Let me know in the comments and I’ll try them out and update the guide here. This entry was posted in open source, sysadmin and tagged code completion, iTerm2, linux, open source, OSX Vim, sysadmin, vim, vim plugins. Bookmark the permalink.